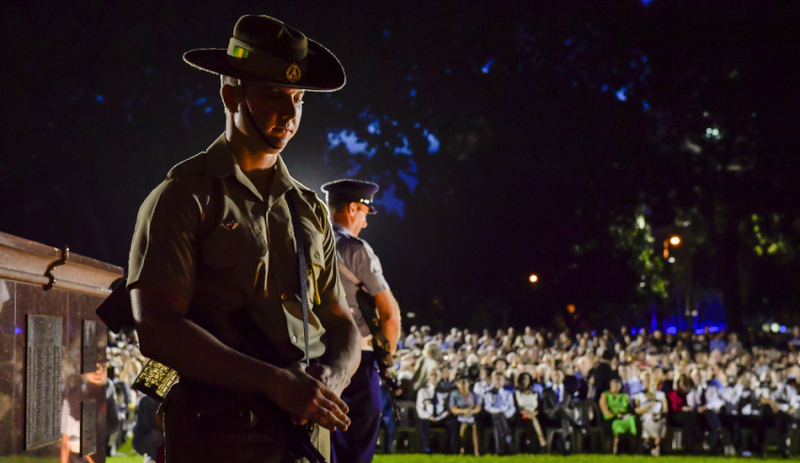 An Australian Army soldier rests on arms during the Anzac Day Dawn Service in Darwin, 2017. Image via Commonwealth of Australia, Department of Defence. Australia’s significant program of military commemorations in-country and overseas has kicked off this month, with 2018 marking the 100th anniversary of the end of the First World War. Minister for Veterans’ Affairs Darren Chester said Armistice Day, 11 November 2018, will mark the end of the most important commemorative period in Australia’s history – the Anzac Centenary spanning 2014-18. The minister has encouraged all Australians to attend the domestic and overseas commemorations throughout 2018 to recognise the service and sacrifice of the men and women who have fought to defend Australia in all wars and peacekeeping operations. "It is always a moving experience to attend a commemorative service in Australia and a truly memorable experience attending a service overseas where Australians actually fought," Minister Chester said. "As the last year of the Anzac Centenary, 2018 is an important year for Australians to commemorate those who have served our country and to learn about Australia’s military history so that it is remembered for generations to come. Many Australians will be planning overseas trips this year and I encourage them to register early for commemorative services to pay their respects." In Australia, commemorations will be held for the 75th anniversary of the Battle of the Atlantic, the 50th anniversary of the Battles of Coral and Balmoral, the 65th anniversary of the Korean War Armistice, the 75th anniversary of Australian work on Hell Fire Pass and completion of the Thai-Burma Railway and the Centenary of the First World War Armistice. A commemoration to mark the Centenary of the Battle of Hamel will be held at the Australian Corps Memorial, Le Hamel, France on 4 July 2018. The 93-minute long battle on 4 July 1918 was a success due to the planning and direction provided by Lieutenant General John Monash. In 2018, Australia will also mark other days of national significance including Kapyong Day (Korean War), Battle of Coral Sea Day, Victory in Europe Day, Battle of Lone Pine, Victory in the Pacific Day, Vietnam Veterans Day, the Battle for Australia Day, Merchant Navy Day and National Peacekeepers and Peacemaker Day.